Propulsion：58 mph (94 kph) max speed, 2 kg of thrust per rotor, 15-in props, 23-min* flight time with X7, 27-min* flight time with X4S. Image Processing and storage：6K RAW @ 4.44 Gbps* video recording, all-new CineCore 2.1, integrated DJI CINESSD.File System:FAT32/exFAT universal file system. Video Format：6K CinemaDNG* and 5.2K Apple ProRes video support, H.265 and H.264 video codec support, 4K video at 100 Mbps. Recorded video can be stored simultaneously on the DJI CINESSD and a Micro- SD card. Integrated into the Inspire 2 is the brand new CineCore 2.1 image processing system, which is capable of recording video in 6K @4.44Gbps CinemaDNG*1, 5.2K @2.08Gbps Apple ProRes*2, and H.265/H.264 @100Mbps. CineCore 2.1 supports burst shots, capturing 10 JPEG + DNG bursts and continuous DNG bursts*3 at 20fps (24MP per shot) when the Zenmuse X7 is mounted. (Currently compatible with the X7, X5S and X4S*4. Please refer to Specs for the supported video formats of each camera). Built-in 3D noise reduction, 3DLUT color management technology, advanced sensor correction. Spotlight Pro is a powerful tracking mode that allows even single pilots to capture complex, dramatic images. It uses advanced visual tracking algorithms to lock onto a subject during flight, regardless of the direction that the Inspire 2 flies, creating shots that would once have required a dedicated camera operator. 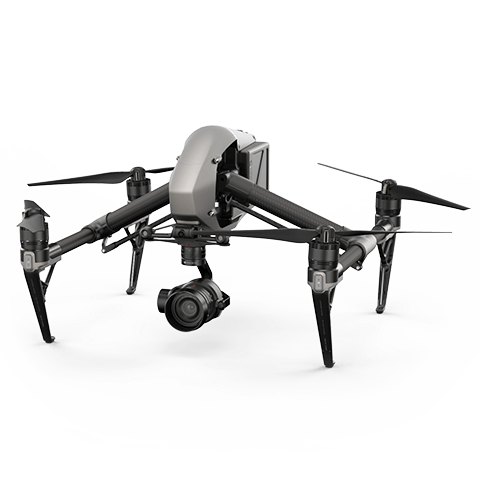 If the gimbal comes close to reaching its rotation limits, the Inspire 2 itself will rotate in the same direction without affecting flight control or the shot being captured to free up gimbal movement. It has two shooting modes, Quick Mode and Composition Mode. In Quick Mode, select an object to begin tracking. In Composition Mode, select the subject and the tracking position. When the subject enters the preset tracking position, press the shortcut to begin tracking. The gimbal can be moved during shooting for composition adjustments.Spotlight Pro is available in Intelligent Flight Modes TapFly, Waypoint, and Point of Interest. In addition to Spotlight Pro, a range of other intelligent flight and shooting modes are available. Obstacle avoidance is optimized when using Point of Interest* and Waypoint* modes, making complex shots simple and repeatable. Also available are QuickSpin, TapFly and ActiveTrack, to simplify challenging shots. The 2-axis onboard FPV camera separates the flight view from the main camera view, effectively giving the Inspire 2 a dedicated TapFly camera. Tap a point onscreen in the FPV view to set a flight route and the Inspire 2 will automatically fly along that route, leaving the pilot to focus on gimbal movement. The ActiveTrack Mode allows the Inspire 2 to recognize a range of objects, from people to bikes to cars to boats. Tracking profiles that can be adjusted based on the subject being tracked means greater tracking precision. Forward and downward vision systems allow the Inspire 2 to create a real-time map of its flight route as it flies. If the video transmission system signal is lost and Smart Return Home is enabled, it is able to fly home along its original route, and change to a straight line when it regains a signal. As it returns, it will use the primary camera to identify obstacles as far as 200m in front, allowing it to plan a safe route home. It is also able to reconnect more quickly after losing connection. The latest update to DJI Lightbridge technology has an effective transmission distance of up to 4.3mi (7km)* and is capable of delivering both 1080p/720p video as well as the FPV view to pilot and camera operator. Users can also switch between 2.4GHz and 5.8GHz** control frequencies to cut through noise for greater signal stability. A new propulsion system optimized for power creates a new level of flight performance. The Inspire 2 flies at up to 58mph (94kph) descends at 9m/s and ascends at 6m/s. It can accelerate from 0 to 50mph (80kph) in just 5 seconds and flies at a max attitude angle of 40°. The two controller sticks are tuned for more sensitivity, making delicate maneuvers easier. More power also allows the Inspire 2 to fly in more extreme conditions, including over 2500-5000m above sea level (using optional dedicated propellers), and in temperatures as low as -4°F (-20°C) using self-heating Intelligent Flight Batteries. Reliability has been further enhanced through dual redundancy of key modules such as the IMU and barometer. The intelligent flight control system monitors the redundancy system, giving it accurate flight data. The new obstacle sensing system helps the Inspire 2 sense and avoid obstacles, minimizing the risk of collision. Dual batteries mean that if a problem occurs on one battery the other is able to continue flight long enough for a safe landing. At the same time, the Inspire 2 propulsion system is driven a PWM signal with serial port signal redundancy so that if PWM signals are lost, transmission will continue through the serial port. This propulsion system has been tested for thousands of hours to ensure reliability, when combined with key sensors and a dual-battery design, overall flight reliability is significantly enhanced. A series of powerful DJI accessories help improve work efficiency and give filmmakers more creative opportunities. DJI CINESSD uses an NVMe logical device interface specification, features four PCI Express 3.0 ports and supports FAT32/exFAT*2 file formats. It comes in 120GB，240GB and 480GB. When using a 240GB or 480GB CINESSD, the Inspire 2 can record videos at write speeds of up to 4.2Gbps, providing enough data to meet demanding filmmaking needs.The DJI CINESSD Station is used to connect the DJI CINESSD into a computer for fast, efficient file transfer. Multilink is designed specifically for use with the INSPIRE 2 remote controller and CENDENCE remote controller. It can create a master-slave controller network with up to three slave remote controllers. Use with the Cendence remote controller and patch antenna for best results. Inspire 2 Activation Key for RAW & Apple ProRes allow CineCore 2.1 to record in CinemaDNG and Apple ProRes*. These are available for purchase separately and allow the Zenmuse X7 and Zenmuse X5S camera to produce the exact file type needed for individual post-production requirements. *Please note that maximum video resolution is subject to DJI CINESSD capacity. Refer to the User Manual for details. A 5.5inch, 1000 cd/m² display, a 7.85inch 1000 cd/m² display and a 7.85inch 2000 cd/m² display, are all designed by DJI to offer the brightness and clarity needed when shooting outdoors. A powerful video decoder integrated in these displays create smooth video and integrated image enhancement increases performance in bright environments. All these displays are operational from -4°F (-20°C) to 104°F (40°C) and are made to work with a replaceable external battery. DJI Focus adds remote focus control to the Zenmuse X7, X5S and X4S. An 800W Battery Station charges up to eight Inspire 2 batteries. With additional space for storing four Intelligent Flight Batteries and a standard battery charger. The DJI Battery Station is also equipped with two USB charging ports. Make the most of your Inspire 2 by using professional handheld equipment when shooting on the ground. A GPS Module for the Remote Controller improves the accuracy of the remote controller’s positioning. Used with the Inspire 2’s Dynamic Home point function which constantly updates the latest location of the remote controller as its Home point, it allows accurate Return to Home when moving around an environment.